This photo was taken at our most favourite spot along the South West Coastline at Cape Freycinet. An absolutely majestic experience. As a single mum with a 15year old daughter holidays are definitely something we both look forward to and enjoy at least once every year. I believe it’s so important to take a break and let loose and what better way to do that than with your children before they grow up and leave home and holidaying with them becomes just a memory. Our last Wyndham break away is still very much a topic of many a conversation and is definitely a holiday we will remember always, as it was so jam packed full of wonderful experiences and memories which we will both cherish forever. For those of you who have never left the east coast of Australia, do yourself a huge favour and jump on a plane to the other side. I was surprised at how cheap the fares were and if you clock up enough frequent flyer points…it’s even cheaper plus, the scenery across our great desert land is somewhat spectacular to say the least. At the end of November 2010, the day after school broke up, we headed west to Perth for the very first time. With our sights set on spending nine days at the beautiful Wyndham Resort & Spa in Dunsborough and four days either side in Perth staying at the Outram and visiting friends, we certainly had plenty of time to explore this amazing part of our country. Having never been to Western Australia before we decided to hire a car so as to see as much as we could of what the West Coast had to offer. Our little Toyota Corolla certainly clocked up some kilometres. The Outram was perfect for our short stay in Perth before heading south and its location very central to all of the local attractions. The free “Red Cat” bus pulled up right at our doorstep every 10-15mins and took us on an amazing sightseeing experience around the beautiful city of Perth. It was a great way to see some of the sites and save the souls of our shoes. We took our time driving south to our next port of call, stopping in at many of the little townships along the way. We were amazed at how beautiful the beaches were, especially coming from Queensland and the dramatic changes in the coastline the further south we went. We reached the Wyndham Resort & Spa in Dunsborough at around 4pm and as soon as we were unpacked and settled in our apartment, Emily took off to the pool while I indulged in a glass of the local wine in the beautiful gardens which surrounded the resort. Even though we experienced some rain during our time here it didn’t stop us. I was surprised at how much there was to see and do within just an hours drive from the resort. Every day we set off on another adventure. I think we explored every white sandy beach along Geographe Bay and the Cape Naturaliste coastline. The calm turquoise waters were so inviting but I must admit a little too cool for me, oh to be young again!!! 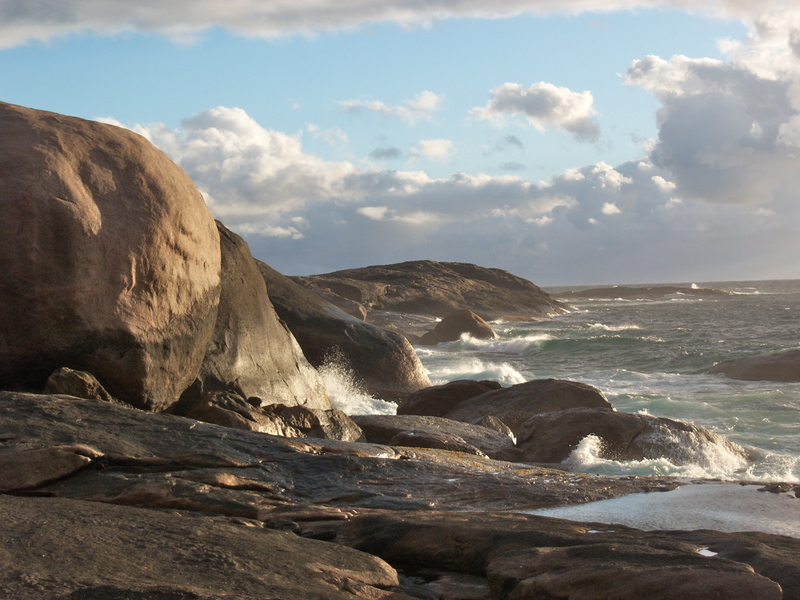 I just loved the spectacular rocky outcrops of Cape Freycinet and Cape Leewin in the south. We were surprised to see so many wildflowers still in bloom along the roadside, I can only imagine how colourful it must be in September during the height of the flowering season. Dunsborough was the perfect location to base ourselves as it was so central to all that the southern region had to offer. Exploring the Ngilia caves was definitely an experience we will not forget in a hurry. Navigating our way around its awesome underground tunnels was something else. Our day trip to Cape Leeuwin would have to have been the highlight of our entire holiday. Every corner the car turned was another picture book photograph. From the enormous cliffs and amazing rugged rock formations along the coastline to the incredible towering karri trees of the Boranup Forrest, we were in absolute awe of God’s mighty creation. Hundreds of wineries dotted the landscape throughout the Margaret River region and the few that we visited, offered the most amazing selection of both wines and cuisine. We certainly packed a lot in to our day. It was hard for us to leave this beautiful part of our country and with only a few days left before we were due to fly home we made a way back to Perth to spend time with friends. The day before our flight home we decided to take in one more site. At the crack of dawn we headed off for the last time in our little car which we named “Zip” on a 250km drive north to Cervantes and the Nambung National Park to visit the historical desert Pinnacles which are these incredible limestone pillars rising up out of the desert, looking like something out of a science fiction movie. We watched the sunset over the ocean for the last time and began to talk about where our travels will take us next. Thanks Wyndham for another great holiday experience. The world with Wyndham is certainly our oyster when it comes to places to visit. This entry was posted in (WA) Margaret River, (WA) Perth and tagged australia, Dunsborough, holiday, Margaret River, Perth, vacation ownership, western australia, worldmark, Wyndham Resorts. Bookmark the permalink.